It’s a beautiful fish, with a delicate red skin, although the color mostly disappears with cooking. New York venders (and restaurants?) 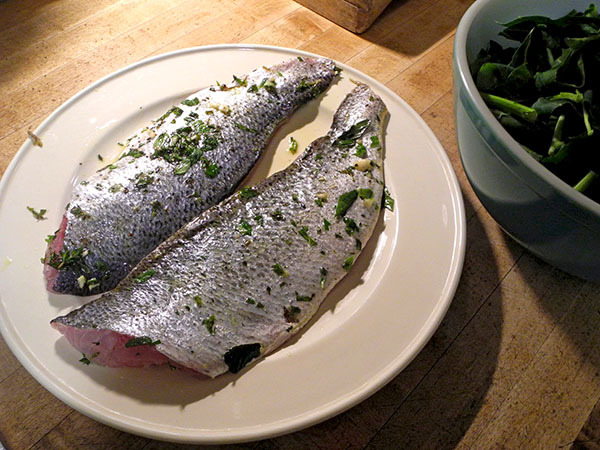 sometimes call it ‘redfish’, but usually it’s ‘sea perch’ or ‘ocean perch’, even if it bears little resemblance to the fresh water perch I grew up with around the Great Lakes. The brilliant color of its scales and its skin would be enough evidence of the distinction, but I have to admit, even at this gap in time and distance from 1940s-50s Michigan and Wisconsin, there may be something to be said about the similarities in taste. The French know it as Rascasse, but there’s some confusion with names on the other side of the Atlantic because it apparently belongs to the family, ‘scorpaenidae‘, which also includes the scorpionfish. 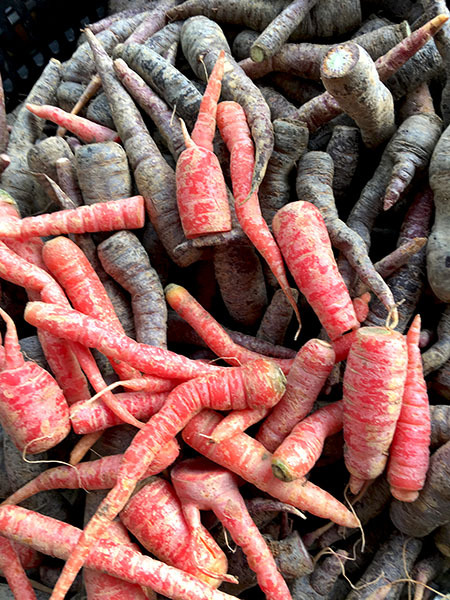 I had collected two kinds of beautiful small carrots in recent visits to the Greenmarket, and last night I decided it was time to enjoy them both. While there was both a primo and a secondo, it was still a very low-stress meal to prepare, probably helping to explain why it turned out so totally delicious. The first course was very simple. The main course may have been considerably more rich, but it was on an almost equally modest scale in volume, and also arguably far less complicated in its makeup. I can’t resist a carbon footprint note: Virtually everything in this meal was grown locally. 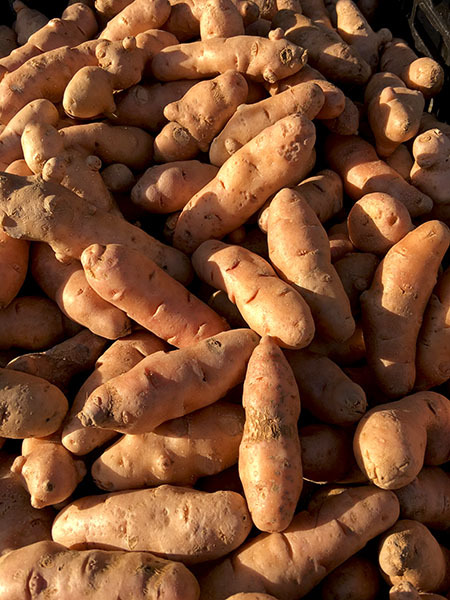 Roasting Rick Bishop’s wonderful ruby crescents was a lot easier – and the end result a lot healthier – than making homemade fries, as in the ‘steak and French fries’ I grew up with, which seemed to be everyone’s favorite dinner in the 40s and 50s. 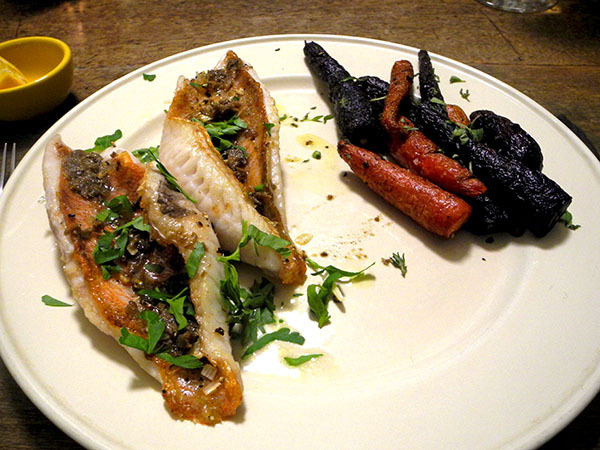 This is a wonderful fish, and the simple recipe I used last night allows its own virtues to be fully savored. 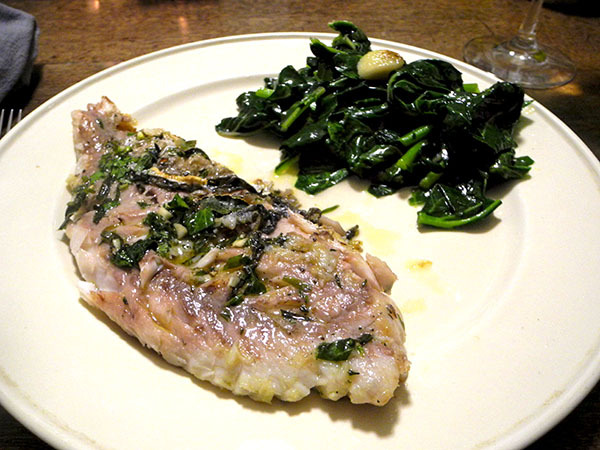 The image immediately below is of the fillets in the marinade, and the bowl of uncooked washed and cut greens). 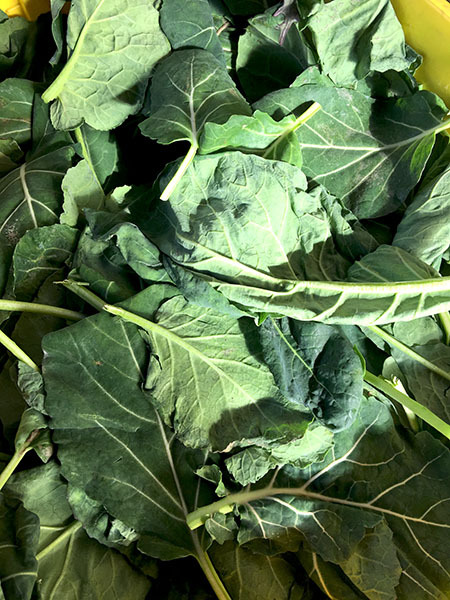 Resting inside a tub in the Greenmarket earlier that day – near the end of January – the collards were totally irresistible. There was a very good cheese course, but I neglected to photograph it. It was to be one of those intervals between nights which featured meat or fish, and it was going to be either a frittata or a pasta. The decision was made shortly after I began burrowing around in my vegetable inventory. 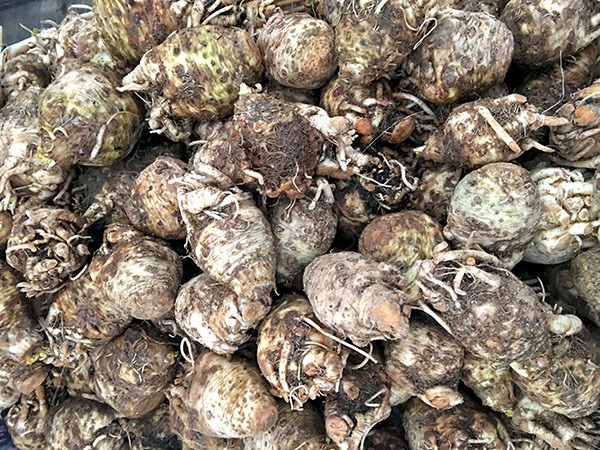 There I found a tidy cache of celery root, and not much more. 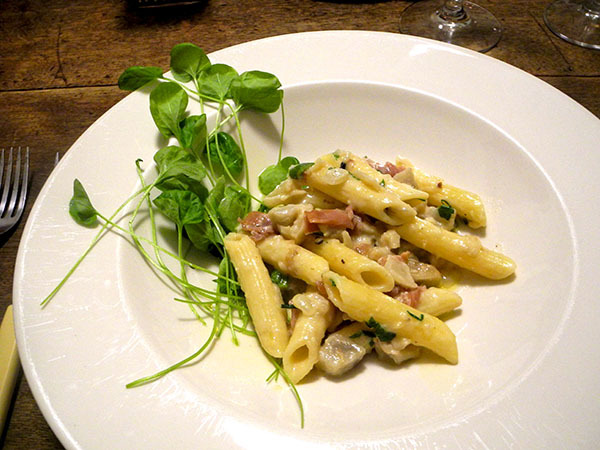 Looking around on the internet, I soon realized that a marriage of celeriac and pasta didn’t seem at all out of the question, especially with the right condiments, and my kitchen can usually provide those. 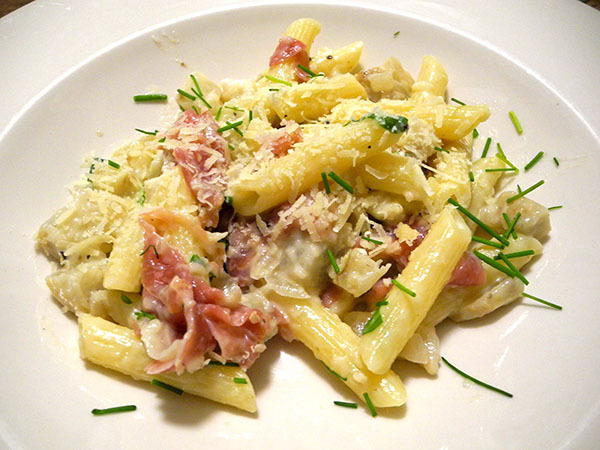 The recipe with which inspired me asked for ham, cut into small strips. I didn’t have ham, which would have been fairly thick, but I did have some very thinly-sliced Speck. I cut it only into segments, which was a mistake: I should have expected that they wouldn’t stay separated; it would have been better to chop the Speck very finely. Have I said often enough before now that I love anything celery-ish? Somewhere, while doing research for this meal, I came across a reference to a Bavarian proverb intended to reassure a cook worried about how large a knuckle to use: ‘‘S is ned, wia grous’ s is, aba wia guad’ s is.‘, it goes, at least as I translated it from the English into Boarisch, with some online help. I think the English went something like, ‘It’s not how big it is, but how good it is’. Barry and I both had numerous occasions to vouch for the goodness of Schweinhaxe, and we’ve never had one that was too small – or too large – and they’ve all been very good. 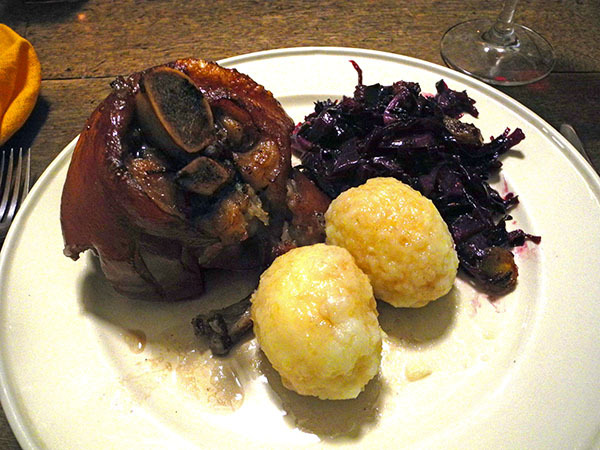 The difference between Eisbein and Schweinshaxe may not always be hard and fast (puns intended), but basically Eisbein, often associated with Berlin, is a cured or smoked (gepökelt oder geräuchertes) knuckle, and Schweinshaxe, very big in Bavaria, is fresh pork. They are both deceptively and incredibly delicious. I’ve cooked pork knuckles before, in that case, 2 years ago, it was smoked Eisbein (beziehungsweise, geräucherte Schweinshaxe); last night I tried my hand at ‘Schweinshaxn‘ (the Bavarian spelling). I combed my books, paper files, and the internet in order to assemble a working model of a recipe. 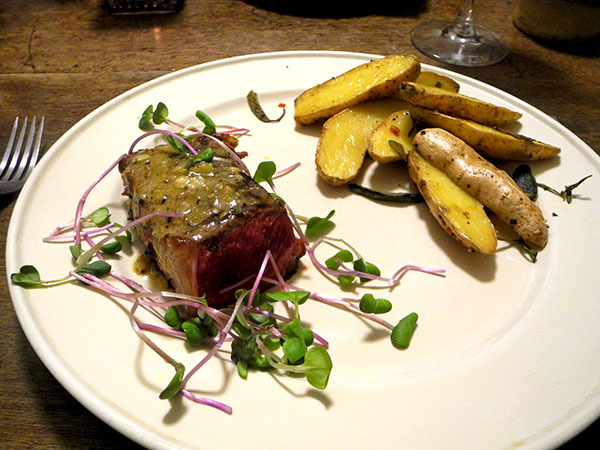 I ended up using most of that included in the large compendium, ‘Culinaria Germany‘. At the last minute I realized that the only beer I had on hand wasn’t a dark brew, which would be preferred in Bayern, but our nor’easter persuaded me not to go fetch another, so I went with the Pavoni, which may have been waiting for its star turn. I was very concerned ahead of time with getting the skin crispy, but only succeeded partially; with hindsight, I believe that finishing the knuckles on a grill pan might have produced the ideal result. 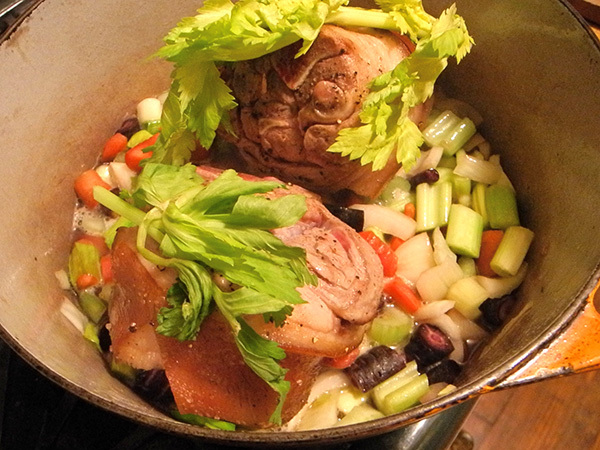 I’ve included images of the vegetables in the pan after the meat had been browned, and another which shows the hocks returned to the pan, before being placed in the oven. If you think you’d like a tasty savory carbohydrate with the texture of mom’s sponge cake, you’ll love Kartoffelklöße (also Kartoffelknödel) as much as we do. 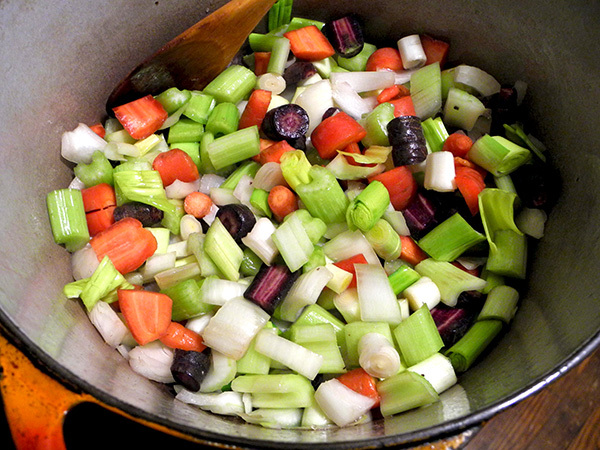 They may also be one of the easiest side dishes ever, as long as you have access to a great market like Schaller & Weber. 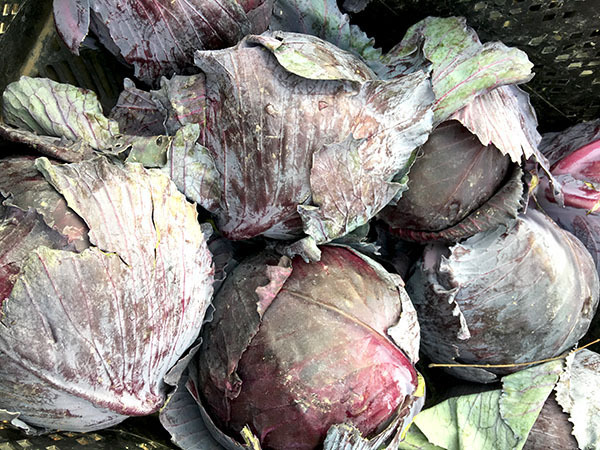 Here I’ve used the image of cabbage in the greenmarket that appeared on this blog once before, but then it was to illustrate a post about a meal which incorporated only a leaf or two. In fact I had bought this head almost a full month ago (winter vegetables, while limited in their variety, are often very forgiving about home storage issues), so the picture probably deserved a revisit.